The Trinity Baptist Church was organized December 7, 1871, and on December 21, 1871, ratified the purchase of the Presbyterian meeting house on 5th Street above Market Street. This building was used until 1896, when it was decided to erect a new edifice ion the same site. 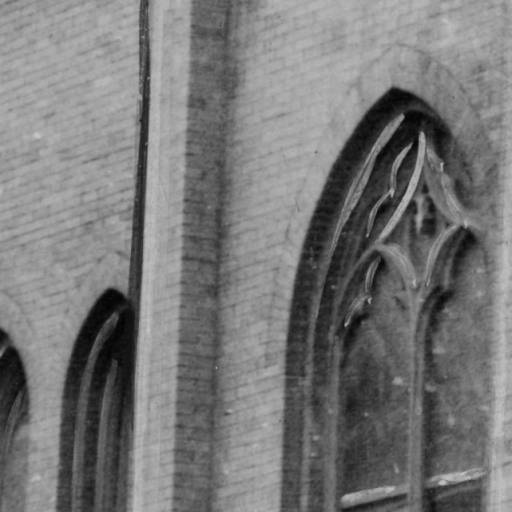 The church remained at this address, 114 North 5th Street until 1918, when the church building was sold to the Victor Talking Machine Company. Victor's original recording studio, on the southwest corner of Front and Cooper Street (now a parking lot for The Victor loft apartments), was surrounded on all sides by factory buildings. Another studio location was the top floor of a production factory on the northwest corner of Front and Cooper Street, which now houses the Camden Board of Education. The original recording studio was too small to fit an entire orchestra, so the top floor studio was used by the Philadelphia Symphony Orchestra and the Boston Symphony to fit all of their musicians. The factory buildings created excess noise which interfered with recording, Barnum says. 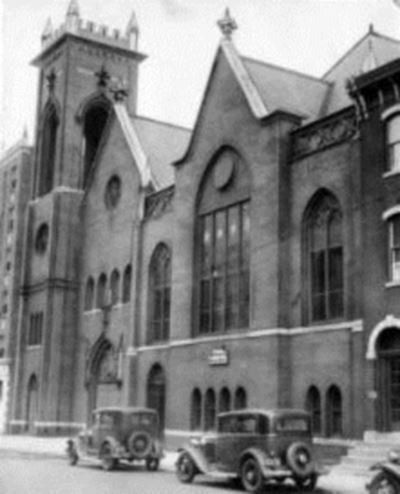 The company decided to purchase Trinity Baptist Church in 1918 for its good acoustics. 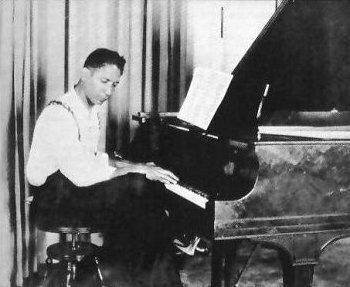 Along with the church, the company acquired a pipe organ, used by musicians such as Fats Waller, who recorded, "Ain't Misbehavin' " and Jelly Roll Morton and his orchestra, who recorded "Down My Way" and "Try Me Out" in 1929." Besides Morton, many of the eras most beloved artists in genres as diverse as blues, gospel, opera, and what we today would call country recorded in the former church. 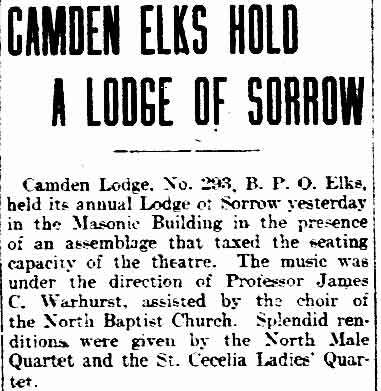 These artists include Enrico Caruso, Irish tenor John McCormack, Jimmie Rogers, and The Carter Family, who recorded "The Wildwood Flower," on May 10, 1929, in Camden. 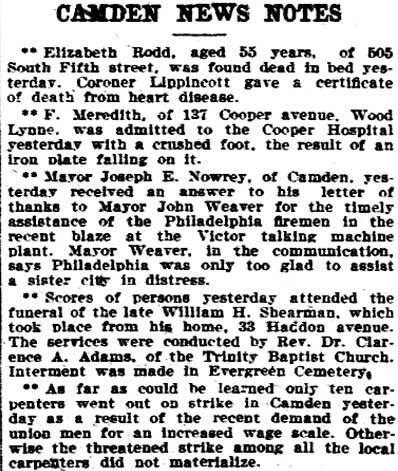 The end of Camden's recording days came when the city decided to construct a subway line underneath the church in 1935, Schopp says. Now a part of the PATCO line, the subway construction created vibrations that interfered with the crude type of sound recording being done at the time. The company moved its recording operations to a New York studio. By February 1936, the former studio had been converted into a gymnasium for use be the Victor Athletic Association. RCA-Victor kept the building as late as 1947, the the Victor Athletic Association and the Victor Employees Salesroom being located there. 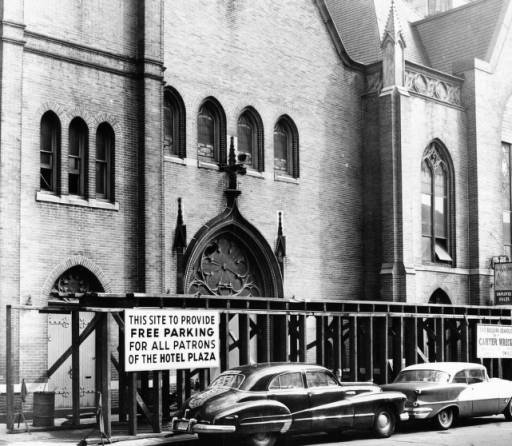 The church was demolished in the 1950s or 1960s and turned into a parking lot for the Hotel Plaza. 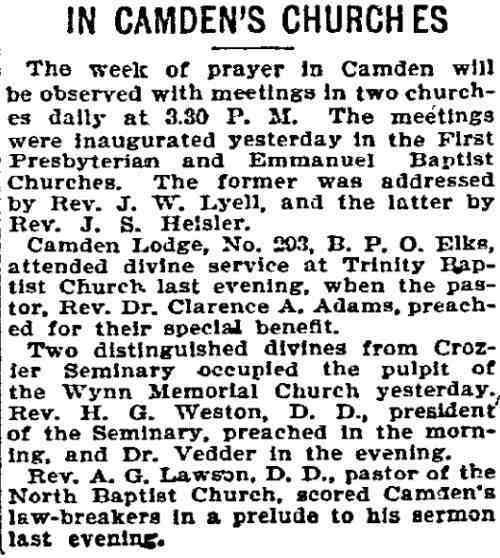 TRINITY BAPTIST CHURCH of Camden was organized on the 7th day of December, 1871, by the adoption of a church covenant and articles of faith as recorded in Rev. T. Hiscox's "Baptist Church Directory," pages 154 to 177, inclusive, and the following-named gentlemen were duly elected the officers thereof: For office of deacons, Thomas Peak, J. D. Rogers and R. H. Morgan; for church clerk, Thomas W. Wilkinson; and at a subsequent meeting held December 21, 1871, the 'following-named gentlemen were elected trustees: Isaiah Woolstoii, E. E. Read, George E. Taylor, William Groves, Alfred McCully, John Burr, William Scudder. The membership of the church numbered about ninety-five. 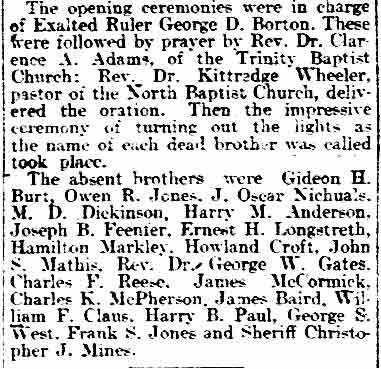 Amongst them, we may mention Deacons Thomas Peak and wife, J. D. Rogers and wife, R. H. Morgan and wife, Deacon Jacob S. Collings, Rev. Charles Sexton and wife, Mrs. E. Westcott, Mrs. Anna Davis and Mrs. Amy Anderson. 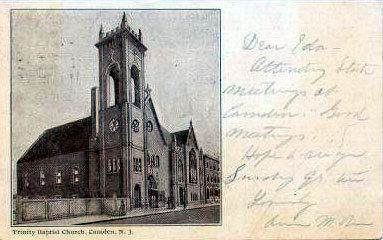 In a few days after the election of the trustees, as above stated, they purchased the building known as the Presbyterian Meetinghouse, on Fifth Street, above Market Street, in Camden, which purchase was ratified by the church December 28, 1871, and on the 7th day of January, 1872, the church held its first public service, Dr. Weston, of Crozer University, preaching the sermon..
On the 20th day of February the church received recognition in a public manner by pastors and lay members of a number of churches of the same faith and order, the Trinity Church, being represented by J.D. Rogers, R.H. Morgan and Thomas W. Wilkinson. The recognition services were held in the meetinghouse purchased by the church. Dr. Sanford, of Salem, preached the sermon and Deacon Thomas Peak received the hand of fellowship from the council by the hand of Rev. Mr. Chambles, pastor of the North Baptist Church of Camden. On the 22d day of April, 1872, the church/by a unanimous vote, invited Rev. A.H. Lung, of. Germantown, Pa., to become its pastor. June 2, 1872, Rev. A.H. Lung entered upon his duty as pastor of the church, and after nine and one-half years of faithful and successful labor he resigned on March 27, 1882, to accept a position as general secretary of the Home Missionary Society of the State of New York, since which time the church has been very successful in her work under the leadership of Rev. O A. Adams, who resigned the pastorate in June of the present year (1886).